After Angkor Wat, my sister and I went to yet another impressive temple complex in Siem Reap and that is Bayon – the temple of the smiling bodhisattva Avalokiteshvara. 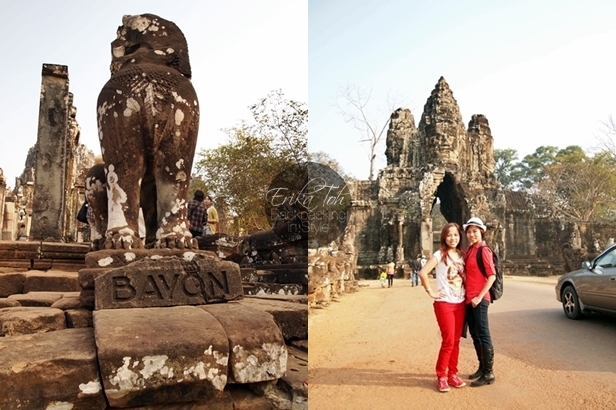 Bayon is located just to the north of Angkor Wat, within the ancient city complex of Angkor Thom. Built around 1190 AD by King Jayavarman VII, Bayon is a unique and picturesque Buddhist temple incorporated with Hindu cosmology elements. 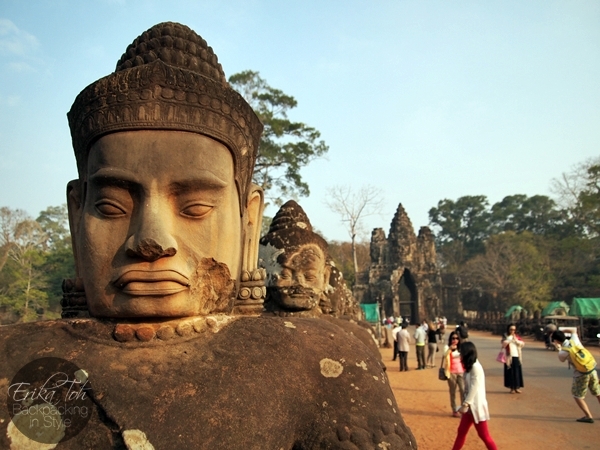 For your info, the Bayon temple complex rises through three levels to a height of around 43 meters. The outer gallery of extraordinary statues and intricate bas reliefs on the first level depicts scenes from everyday life and historical events. The inner gallery on the next level depicts mythical deities, figures and legendary events/stories of that era. The third level is where the famous smiling faces are. Being in the temple complex gave us an overwhelming sense of peace and serenity. Needless to say, Bayon temple is a unique and must visit place in Siem Reap, Cambodia. Baphoun was the third temple that we visited after Angkot Wat and Bayon. The temple is located about 200 metres away from Bayon, and it is a single sanctuary temple-mountain situated on a high base; a symbolical representation of the sacred mountain, Mount Meru in Hindu and Buddhist cosmology. A rectangular sandstone wall encloses the temple and a long sandstone elevated path at the east entrance forms a bridge to the main temple. Unlike Angkor Wat and Bayon, this temple requires a difficult climb via its very steep and narrow steps to reach its summit where the view is simply breathtaking! Those who are afraid of heights might want to give this feat a miss. For the record, I nearly had a heart attack and suffer a light case of vertigo while descending the steps. Things will be much easier if there was not a long line of awkward tourists behind my back to hurry me by as I steadily made my way down with utmost care for the last thing I want is to suffer broken bones as my souvenir from Siem Reap, Cambodia! Then again, we only live once so it is worth a risk to take. 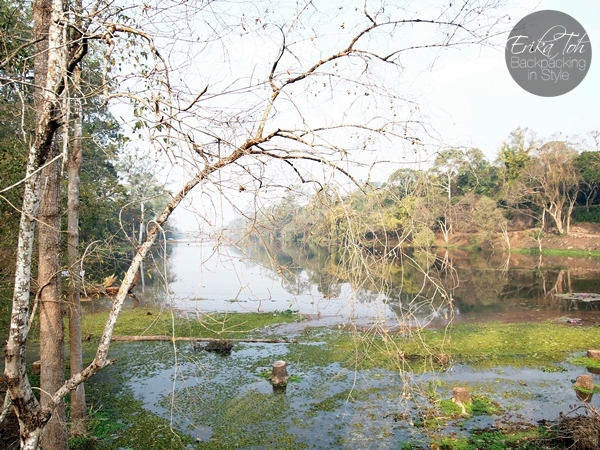 We made it to the top – the breathtaking view from the summit of Baphoun, Siem Reap! This temple needs no introduction! Made famous after being the setting of the action-packed movie Lara Croft: Tomb Raider, Ta Prohm is high on the must visit list of the temples by visitors in Siem Reap, Cambodia besides Angkot Wat. I personally love this temple the most not because of its popularity, but for its ethereal charm and personality. This jungle temple vibrates an aura of mystery and tranquillity at the same time that has a significant effect on me. Enormous fig, banyan and kapok trees spread their gigantic roots over the temple, breaking walls and terraces apart, as their branches and leaves intertwine to form a roof-like structure over the temple. This gives it a one-of-a-kind picturesque appeal to everyone who visits the temple. That aside, my sister and I spent quite some time at Ta Prohm, exploring the intricate temple complex through a labyrinth of narrow passages, discovering many ruins and remnants of the once glorified Khmer civilisation in awe. Photo on the left: The piece of the all-seeing eye, perhaps?